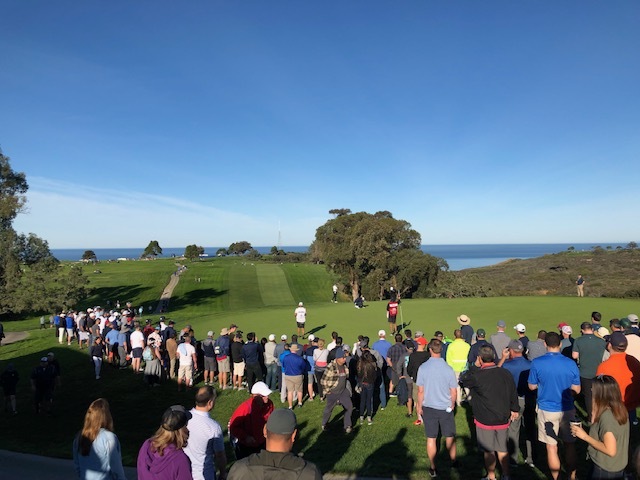 Southern California welcomed the world’s top golfers this past 4 days at the Farmer’s Insurance Open PGA Tournament, played at the prestigious Torrey Pines golf course in San Diego. From the 24th to the 27th of January, golf fans were in for a treat at one of the world’s most beautiful championship golf courses, as many pros including Tiger Woods, Rory Mcilroy, Ricky Fowler, Jason Day, Adam Scott and Justin Rose displayed their talent on the sunny California shores. England’s Justin Rose shot his second straight 3-under 69 on the final day to win by three over Australian Adam Scott. Rose opened on Thursday with a 63 on the easier North Course and continued with a 66 on the South on Friday. He just kept his remarkable pace of play into the weekend and made the win at Torrey Pines look easy. He clearly came out on top, the 38-year-old Englishman now joins Rory McIlroy and Sergio Garcia as the only Europeans to win double digit times on the PGA Tour since World War II. He also finished at 21-under 267 for a two-shot victory, therefore becoming the first player since Peter Jacobsen in 1995, when the South and North courses at Torrey Pines were 700 yards shorter, to post all four rounds in the 60s at this event. This was Adam Scott’s first time at this tournament and coming second is no small feat. He finished two back of winner Rose, and putted almost entirely with the Torrey Pines flagsticks in. The runner-up posted a 19-under total that in most years would have provided a three-shot victory. Tiger Woods was a crowd favorite, and following a 70-70-71 start he came back strong with a 67 on Sunday. He hit the ball better as the event went on, and this is what you would expect to see from any pro at the first tournament of the year, in fact, it was his best finish at Torrey Pines in 12 years. Tiger finished with a 5-under 67 in the final round on Sunday to take his overall score of 5 under at the start of the day to 10 under by the end of it. Still not enough to make it but a promising start for the season to come. As the winner, Rose cashed in on the $1.278 million first-place check for his victory at Torrey Pines, he has now surpassed the $50 million mark in career earnings. Runner up, Scott earned $766,800. The prize money is just one indicator of the skill required to play golf at this level, this sport is definitely not just a walk in the park. For all those who were lucky enough to be at Torrey Pines this past weekend and experience the magic of this course and the incredible skill of the pros playing, it will stand out as an incredible way to start the new year.